When its time for celebration, then no one wants to be left behind. So why not go big with celebrations? These students took their party to an all new level where a video of some students cutting cake with a machete (sword) has gone viral on social media. According to Times of India (ToI), in the 30-second long video, one can see atleast 25 college students shouting around a big yellow cake with ‘Royal II M. Com’ written on it. As the group shouts and cheers, two students cut the cake placed on the seat of a scooter with a machete (sword). 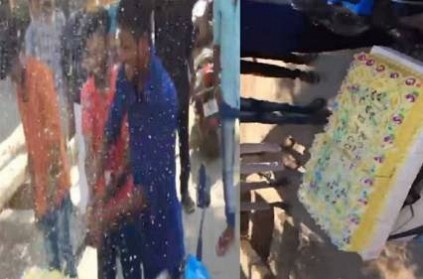 This crazy cutting of the cake took place on the Nelson Road at Tamil Nadu’s Srirangam city where students were celebrating a farewell party. On being questioned about this incident, police said that they have not received any complaint about the incident but added that they would investigate the matter. கோவை: தனியார் கல்லூரி ஊழியருக்கு பாலியல் தொல்லை கொடுத்த இயக்குனர்! This page contains news relating to various facts and events. The views are generally about current affiars and general topics in diversified areas such as political, international, national, and regional issues, sports, health, travel, lifestyle, technology and business. People having similar interets on the above topics will find this page useful. College students cut cake with machete in Tamil Nadu, video goes viral | Tamil Nadu News.